Artist Ray Axiaq against the Sicilian backdrop. 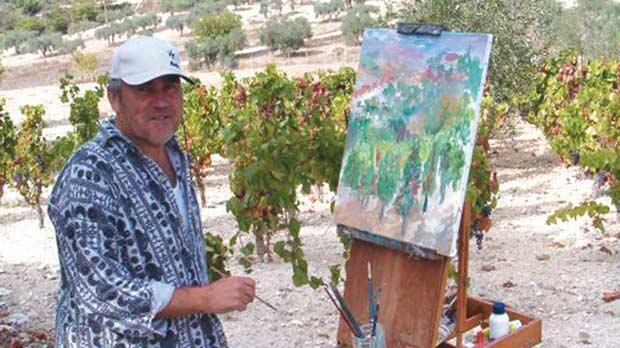 For the fifth year running, a group of Maltese artists will be travelling to Sicily to take part in a 40-hour course of painting en plein air entitled La Sicilia nel pennello dei Maltesi (Sicily as painted by the Maltese). The course, led by 47-year-old Sicilian artist Salvatore Montanucci, who has lived in Malta for 20 years, will be leading around 10 Maltese artists to Caltanissetta between July 14 and 21. They will be joined by another group of Sicilian artists for a shared experience. Montanucci’s initiative this year is being supported by the Education Ministry and by the Superintendence of Culture, municipality and chamber of commerce of Caltanissetta. The course will be conducted by Montanucci himself, who will be assisted by a young artist from Gela, Renato Belluccia, who is a student at the European Institute of Design in Turin. Montanucci, who has given numerous art courses and exhibited in various countries, has been invited by a Chinese university to lecture in China next year. In Malta he has taught at Mcast and at the Russian Boarding School in Marasascala, and also privately. The course is open to those who have a basic experience of art but who are willing to learn and improve their technique. This year participants will be able to discover the rich architecture of Caltanissetta, work together and learn from each other. At the end of the course an exhibition of the works produced will be held, at which the artists will receive a certificate. The course is free but the number of participants is limited. Participants have to pay for materials and equipment, travel, food and lodging. For information contact Salvatore Montanucci at montanucci@hotmail.com by July 5.